← What have I been up to, lately? The other evening, I went to see my friend Peter Shirley talk to the Sandwell Valley Naturalists Club about the wildlife he saw in Canada. Pete is @PeteWestBrom on Twitter and you should follow him, and read his Birmingham Post column, if you’re interested in nature, wildlife conservation, or green issues. He mentioned to me that he was looking for some software to display images in a slideshow, but sorted into his preferred order, rather than by datestamp or file name. He wanted something less cumbersome than PowerPoint or its free equivalent in LibreOffice, Impress. I said I knew of something that would do the job, and would send him details. But on the principle of responding to technical questions openly, in public, in order to more widely share and disseminate knowledge, I’m posting the answer here, and I’ll send him a link to this post. For some time, I’ve used the excellent IrfanView programme, an image viewer which also serves as a lightweight, but nonetheless powerful, image editor. It’s not Photoshop (nor the free equivalent, GIMP), but it’s great for cropping, rotating, changing contrast or brightness, and other similar tasks, which it can also do on a batch basis. It’s free for non-commercial use, for Windows. Its author, Irfan Skiljan, is also very responsive to user requests, and the programme has several features which he’s kindly added at my request. And it has a slideshow feature. IrfanView slideshows can be used for talks and presentations like Pete’s, or be left unattended, as a “carousel” or “kiosk” style display. To make one, first, download and install IrfanView, and any of its various plug-ins you might use (I simply download and install the full set of plugins, in one file). Use the top-right quarter to navigate to the images you wish to use. You can select them in batches and use the add button or double click on them to add them to the list, which will appear in the bottom-right corner, one at a time. Once you have your list of files, you can use move up, move down or sort, to carry out those actions, and you can remove files that are no longer needed. 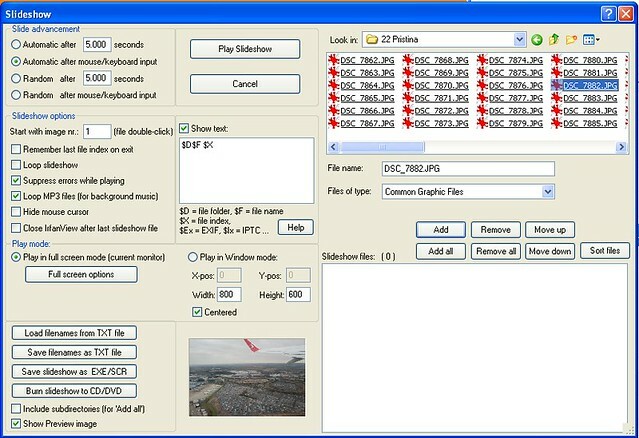 You can also include mp3 files, to have music, or other audio, played along with your images. That could even be a narration. In the top left section, chose whether to have automatic transitions, based on a timer, or a keyboard/ mouse action, or random transitions. Below that, select your other options (I won’t list them here, but you can play around with them, to suit your needs — they should be reasonably self-explanatory). Use the “play” option to run through the presentation and make sure you’re happy with it. You can reorder, add or remove images at any time. When you’re happy with the slideshow, you can save the running order to a text file (and later reopen it), though that assumes that the images remain on your machine, in the original folder(s). Alternatively, you can burn the whole show to a DVD, or create an executable file including the images and running order. And that’s it. What’s not to like? This entry was posted in photography, reviews and tagged HowTo images, IrfanView, PeteWestBrom, photgraphy, presentations, SandNats, slideshows, software, tutorial. Bookmark the permalink. Could do with a Mac version of something like that. Seems the nearest equivalent is generally thought to be http://iview-media-mac.en.softonic.com/mac I’ve not used it, myself, though. I love IrfanView – I’ve not used it for this but I’ve used it all the time for batch re-naming (eg adding date/time to filenames) and to batch re-sizing (to fit a defined height/width window) for eg websites (and indeed batch cropping for thumbnails). Keep discovering new things it will do.